Between 450 and 500 people were believed to be on board, and several hundred are still missing. ROME — The rickety fishing boat was the third of the night to head toward the tiny Italian island of Lampedusa, overloaded with African migrants seeking a better life in Europe. Most never reached shore. After the boat started taking on water, someone on board set a fire to get the attention of passing ships. The flames spread and panicked passengers surged to one side to avoid the fire. The vessel capsized, and hundreds of men, women and children who didn’t know how to swim were flung into the Mediterranean Sea. At least 114 people died and some 200 were still unaccounted for late Thursday, Italian officials said. “We need only caskets, certainly not ambulances,” said Pietro Bartolo, chief of Lampedusa health services. It was one of the deadliest accidents in the perilous crossing thousands make each year, seeking a new life in the prosperous European Union. Smugglers charge thousands of dollars a head for the journey aboard overcrowded, barely seaworthy boats that lack life vests. Lampedusa, 70 miles (113 kilometers) off Tunisia and closer to Africa than the Italian mainland, has been at the center of wave after wave of illegal immigration. “It’s an immense tragedy,” Mayor Giusi Nicolini said. Between 450 and 500 people were believed to be on board the boat, which set sail from the Libyan capital, Tripoli, and capsized about a half-mile from Lampedusa; health commissioner Antonio Candela said only 159 were rescued. Bartolo initially put the death toll at 94 but said it would certainly rise as search operations continued. Italian coast guard divers later reported seeing another 20 bodies on the ocean floor. The deaths of so many people may have come down to the lack of a cellphone. The 66-foot (20-meter) boat was carrying migrants from Eritrea, Ghana and Somalia, Italian coast guard spokesman Marco Di Milla told The Associated Press. It nearly reached its destination, getting as far as nearby Conigli island before it began taking on water, Interior Minister Angelino Alfano told reporters. Usually, smugglers have mobile or satellite phones to call for help when they near shore or run into trouble. Instead, someone on this boat set fire to a piece of material to attract the attention of passing ships, he said. Only three of the estimated 100 women on board were rescued — and none of the 10 children were saved, said Simona Moscarelli, of the International Organization for Migration in Rome. Two of the dead women were pregnant. Italian coast guard ships, fishing boats and helicopters from across the region searched for survivors. 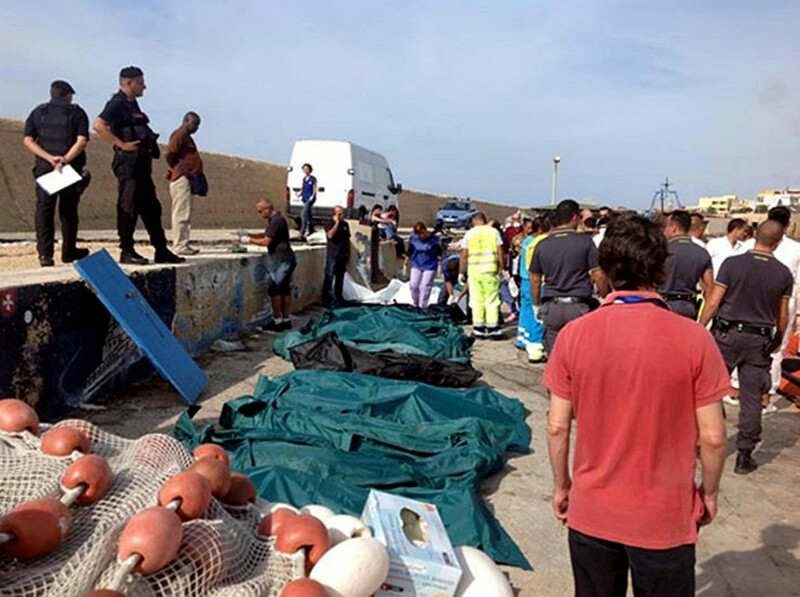 Rescue crews hauled body bags by the dozens at Lampedusa port, lining them up under multicolored tarps on the docks. Coast guard divers found the wreck on the sea floor, some 130 feet below the surface, Cmdr. Floriana Segreto told the AP. Survivors packed Lampedusa’s detention center for migrants, along with those aboard the two other smugglers’ boats, which reached shore safely. More than 1,000 people were squeezed into a space built for 250, Moscarelli said. Medical workers scrambled to treat the injured. Migrants who arrive in Lampedusa are processed in centers, screened for asylum and often sent back home. Some slip into the general public and make their way to northern Europe, seeking to blend into larger immigrant communities. In Italy, migrants can work legally only if they have a work permit and a contract before they arrive — a policy pushed through by Italy’s anti-immigrant Northern League party. Thursday’s disaster was the second shipwreck this week off Italy. On Monday, 13 men drowned while trying to reach southern Sicily when their ship ran aground just a few yards from shore. A host of Italian officials demanded the 28-nation European Union do more to combat smuggling operations and help countries like Italy cope. 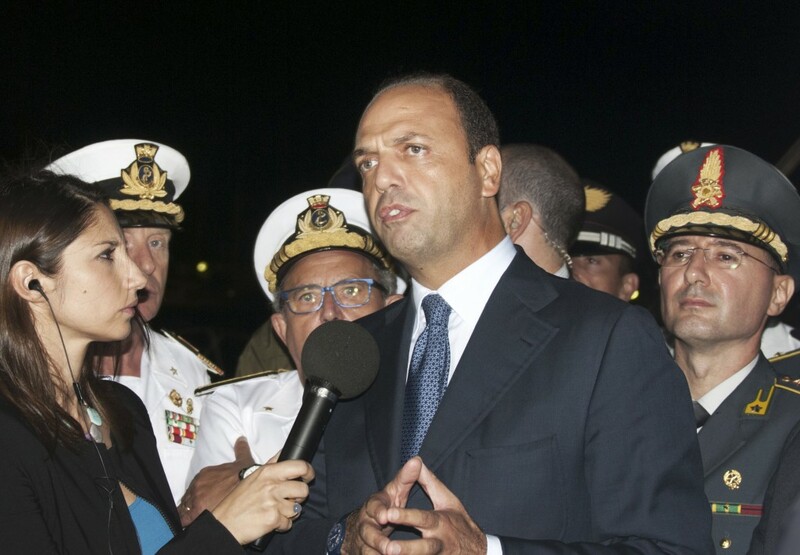 “Let us hope that the European Union realizes this isn’t an Italian problem but a European one,” Alfano said as he headed to Lampedusa to oversee the recovery operation. Pope Francis, who visited Lampedusa in July to bemoan the frequent deaths of migrants, sent his condolences. “It is shameful!” he said during an audience at the Vatican. Hundreds of migrants reach Italy’s shores every day, particularly during the summer, when seas are usually calmer. According to the U.N. refugee agency, 8,400 migrants landed in Italy and Malta in the first six months of this year, almost double the 4,500 who arrived during the first half of 2012. The numbers have spiked in recent weeks, particularly from Syria. Still, they are a far cry from the tens of thousands who flooded to Italy — many through Lampedusa — during the Arab Spring exodus of 2011. Before Thursday’s tragedy, the U.N. High Commissioner for Refugees had recorded 40 deaths in the first half of 2013 for migrants arriving in Italy and Malta. Last year, that route saw 500 deaths.